How all of the above is achieved should not be questioned so long as they are fulfilled in a way which ensures your child has all their needs met in a way that ensures they are supported, happy and healthy. I showed my ‘live and let live’ attitude with a quick checklist I first published on my Facebook Page in 2016 that turned simplicity into controversy. Intended as a little, relaxed fun to try and put at ease the parents out there that are feeling judged within their parenting choices every day. The list very quickly reached over 10 million people worldwide and attracted huge debate. We should all always feel our opinion is valid but some of the comments left me both saddened and shocked. I saw the breastfeeders battling the formula feeders, the co-sleepers battling the cot sleepers, baby led battling spoon fed. I found if you say you’re going with the flow then you’re deemed uncaring and not bothered about achieving the best for your child. But if you’re making informed choices you’re deemed to be trying too hard. But the worst thing was the judgement and judgement where it really isn’t needed. My checklist was supposed to embrace the fact that we are all doing our best. We’re all doing it differently but we all strive for the same outcome. It was a post that tried to say, ‘forget about parental judgement’. It was a post to say, ‘stop bashing each other’s parenting choices’. It was a post to say, ‘stop making one another feel guilty’. It was a post to say, ‘live and let live’. It was a post to say, ‘you’re doing OK’. But the point was missed, overlooked in favour of judgement. The irony was that rather than encourage people to stop judging each other I found it added fuel to the fire and highlighted exactly why parents are feeling guilty over their chosen methods. And I saw the parenting world lock horns. 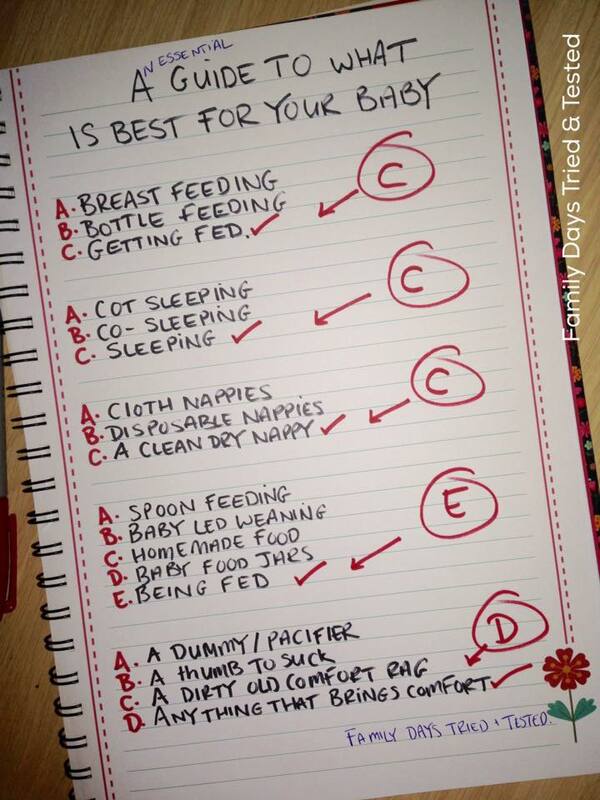 Perhaps the most ironic point was that as the creator of the checklist, and a mother to seven children, I hadn’t mentioned the methods I had used within my own parenting. Yet breastfeeders assumed that I was not being supportive toward that method without stopping to ask what my methods were. Equally on ‘sleeping’ people chose to argue as to whether co-sleeping or cot sleeping was the best option and overlooked that the point was not about the methods that we choose but rather that we do the best in our own ways and should respect how our ways vary dependent on our own situations. So, what I’m trying to say is read into the post what you like. Take from it what you will but do what is right for you and your child without guilt. Don’t place guilt or judgement on others for their choices. Respect each other’s beliefs and abilities. If you sit next to a parent in a park and one of you has their head buried in a parenting manual whilst the other is completely winging it then respect each other, you’re both still doing fab. We need to stop laying parental guilt upon each other and start uniting and supporting each other. We need to recognise difference and unite as parents regardless.